It's time to say Goodbye to June 2016 and have a look at the weather conditions of this month around Koh Samui. It's been an interesting month of June this year, with plenty of sunshine during the first two weeks of June, making it very hot and having the hottest day of the year sofar with one day hitting the 38C mark. 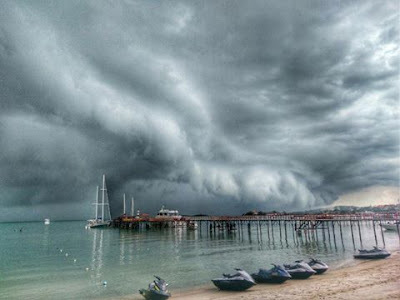 This was very unusual for a typical June and the second half of this month saw more typical June weather with partial or fully covered and cloudy skies with tropical showers coming in on a regular base, sometimes accompanied by a strong breeze. A deer skull at the Chinese Temple of Guanyin in Phang Ka. There used to be a lot of deer around Koh Samui, in a lot or rather most old or traditional Samui houses you will find a reference to deer in the house hold, in the form of skulls or small wooden deer heads or the like. During this June of 2016 I was home on Koh Samui all month and enjoyed a visit by my sister and her husband who came to visit their son who is participating in a six month internship at the Tongsai Bay hotel, one of the very first five start hotels on the island. We had dinner at our treasured and favorite place including Kobori the Japanese restaurant in Maenam and JuzzaPizza in Fishermans Village. This month I also had the opportunity to participate in two running races, the yearly Cancer Care run in Nathon, which I now participated in for six consecutive years and last weekend I ran the 12th Donsak minimarathon. Now it's time to look ahead, to the 2016 July version, which will see me in Moalboal in the Philippines and on Phuket for PADI IDC programs, a busy month for travelling and work again. The forecast has changed slightly, it should remain fairly to mostly cloudy until the second July weekend with rain during mid next week. The next Samui Green Market is Sunday 17th July will take place as usual at Elysia in Fisherman's Village, starts at 3pm and runs until late. There will be plenty of vendors selling organic foods and various other products and produce. We buy some great breads there from a few differents vendors, including sour dough bread. There's also food for sale in case you get hungry during your visit, prepared by the Elysia. The Samui Green Market is well worth visit and I hope you will go out and visit and support the Samui Green Market. Just remember, don't bring any plastic bags! We found this common rat snake in our garden yesterday, supposedly a very rare snake on Koh Samui, in contrast to it's name. It hasn't been spotted for over 20 years until during the last couple of weeks the Samui snake handler was called in twice to the Choengmon area and caught two snakes there. It seems there's a few around now in this part of the island. They are non harmful to humans and their diet largely consists of rats. We have small children and my wife has none of it that snakes are in our garden, so we killed this species. The forecast predicts cloud cover until mid next week when it's supposed to clear up again and the sun might break out. Today and tomorrow also sees a strong breeze and until mid next week you may expect some tropical showers. Yesterday I presented once again a Box jelly fish awareness and prevention presentation at Zazen Boutique Resort in Maenam. Fifteen of Zazen's Boutique Resort staff attended the presentation and with the inofficial start of the box jelly fish season in the Gulf of Thailand, it was a great moment in time to visit Zazen Boutique Resort again and give a new and updated presentation on box jelly fish awareness and prevention. In very broad terms one can say that the box jelly fish season in the Gulf of Thailand and around Koh Samui and it's neighbouring islands Koh Phangan and Koh Tao runs from July through to November, although there are also plenty of registered and known encounters outside of this time frame. The presentation went down very well and was accepted and watched with plenty of interest. It was good to see that some staff who already participated in the October 2015 box jellyfish and awareness presentation at Zazen Boutiques Resort, attended again and remembered things from the October presentation. There's no need to panic about box jelly fish being around on Koh Samui's shore, but awareness and being prepared helps a lot. 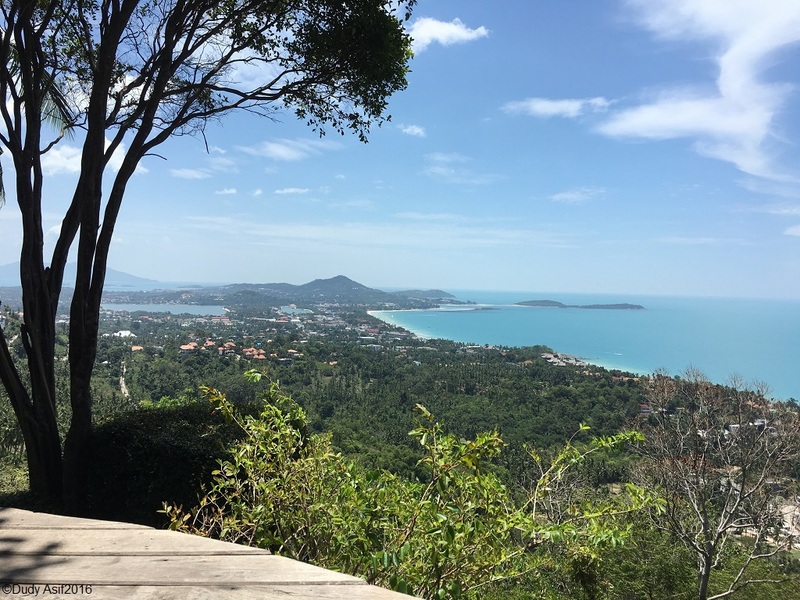 In the meantime, there has been plenty of activity going on on Koh Samui and next month Kim Moss will visit both Koh Samui and Koh Phangang. Kim is a expert on net protection for box jelly fish. Stay safe and enjoy the island, in order to prevent being stung by box jelly fish make sure that you are covered up, use a full body lycra suit and have plenty of vinegar available. The forecast for the next ten days predicts plenty of cloud cover and not that much sun with an occasional tropical shower. There may be some good breeze blowing in until Thursday. The forecast predicts a surprising nice and sunny day today, to be followed by the cloudy days predicted during previous days, with a strong wind come Wednesday. It's a late update since it wasn't until right now, on our way back home on the ferry from Donsak, after having participated in the 12th Donsal minimarathon, that I finally have time to sit down and update the blog. View over Chaweng beach, picture by Dudy Asif, a blog follower who sent me this picture. Thanks Dudy, much appreciated! The forecast hasn't changed that much since yesterday, it will remain mostly cloudy for the next ten days with the chance of an occasional tropical shower. We're off to Donsak today where I will be running a mini marathon tomorrow morning. The forecast has changed and now we can expect cloudy skies for the next ten days with very strong, storm like winds on Monday and Tuesday and occasional tropical showers throughout the next tend days. Two Family Mart outklets, facing each other at a small road crossing near the Bophud traffic lights. Within two hundred meters there's another outlet. Howmad is this? The forecast predicts mostly cloud cover for the next ten days except over this weekend it may be sunnier. An occasional tropical shower may also be part of the day or night. Yesterday saw a fairly nice day, it stayed dry and we had a sunny day, atlhough it didn't get too hot. Max temp reached 32C but with a light breeze that wasn't too bad at all. The forecast for the next ten days may be a sunny Saturday and all other days cloudy to very cloudy with occasional (tropical) showers and with a very strong wind blowing in on Monday and Tuesday. The rest of these ten days may see a mild breeze. In March we spotted this Chinese Temple of Guanyin in Phang Ka, when we were retunring on the boat from our visit to the U Koh Madsum resort and we saw the profilic pagoda shape looking out over the Phang Ka bay. This just asked for being visited and explored, so after landing at the pier and colecting our car, we headed out to find this well hidden temple. It is not too far from Sweet Sisters Cafe and you can easily squeeze in a stop here to satsify your stomach, so we're looking at the Southern end of the island, you can find the Chinese Temple of Guanyin in Phang Ka here on Google maps. We had to ask for directiosn twice, but once you find it, it is well worth a visit. Check the previous link to help you find it. It is well away from the throdden path, thus also very quiet and relaxed. It's also a fairly small area so it doesn't take hours to discover everything although you can easily spend hours in the quiet surroundings of this temple. Straight at the entrance to the Temple grounds, there's a pagoda and nearby you can also park your car or motorbike. From here you can walk the surroundings and visit the buildings but there are also plenty of statues to admire and explore. Near the sitting Buddha statue are tree trunks covered with clothes and other gifts, which gives a strange feel to that particular area of the Temple grounds. It shows once more that he Thai people in general are still very much attached to nature, the way they make merit and involve nature in this process. This small statue caught my attention and I like it a lot. A reclining Buddha statue, very nicely done. The whole setting just looked perfect to me. There are plenty of other statues to be explored and found, from big ones to small ones just like the one pictured above. The Chinese Temple of Guanyin in Phang Ka is really out of the way but when you decide to visit here, there are so many other things that you can check out on the way down to this quiet corner of Koh Samui, to keep you busy for more than just a day. It's well worth a visit and you can get some nice pictures to boot. Hope you enjoyed this blog post of our trip this Chinese Temple of Guanyin in Phang Ka. Its a unique temple and it's waiting for you! The forecast for the next ten days shows that we should have plenty of cloud cover with an occasional sunny break but on the other hand thre's also an option for some drizzle or a tropical shower. This is more like your average June weather, compared to the very sunny and hot first half of this month. The forecast has changed a bit and unfortunately not for the better, it seems like a more typical, monsoon like June weather is moving in and for the next ten days it's predicted to be cloudy with occasional showers after next weekend. The forecast predicts fairly cloudy skies during the next ten days except with some sunnier skies over next weekend. An occasional tropical shower may be possible as well. The forecast predicts the could cover to remain here until Tuesday with an occasional shower and from Wednesday onward the sun should break through again and we should have nice, warm and sunny weather once more without rain. The forecast predicts hard rain tonight and tomorrow morning but come Tuesday the sun should be back and the rain should have mostly gone. In the meantime enjoy a couple of cooler days. The forecast predicts fairly cloudy skies until mid next week with a nice breeze until the weekend. 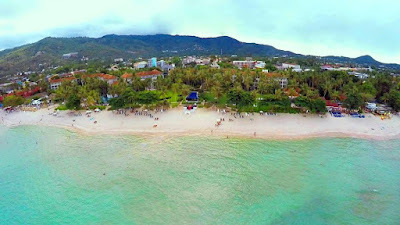 An occasional shower may drift along, like a typical June day on Koh Samui can be. The forecast predicts cloudier skies until the weekend with a nice breeze and after the weekend we might be able to embrace the sunny skies again. The forecast predicts a nice breeze until the weekend with cloudy skies and an occasional shower. Keep enjopying this unusually hot and dry June weather. The forecast predicts a fairly cloud sky to blue skies for the next ten days with possibly some heavy clouds and rain come Saturday. The forecast for the next ten days is most likely similar to what we have right now, blue to fairly blue skies until next weekend when we may see some more clouds. The nice and cool breeze will slowly fade out over this week. Enjoy the unusual hot and sunny June weather as long as it will last! The forecast still insists on predicting cloudy skies, with a breeze and occasionally a tropical shower, ho it should be in June. Daily weather situations proof a different pattern, so let's hope the daily patterns will sit this one through. Yesterday saw a very blue sky all day long and it was warm, edging in on hot. Max temp reached 35C despite a nice breeze all day long. The forecast is more of the same for the next ten days, hot and sunny days with a breeze, although cloudy skies are predicted. We'll see how this pans out. Wednesday and Thursday may see a shower. Yesterday it was partially cloudy with plenty of sunshine but also cloud cover at times. Max temp reached 33c under a dry sky. The forecast didn't change much for the next ten days, a mixture of xloudy and partially cloudy skies which should also bring plenty of sunshine at times, with a bit of a colling wind. It should stay mostly dry except for a rather rare tropical shower. The forecast predicts cloudy skies for the next tend ays with a bit stronger wind now and an occasional tropical shower. The newly opened Hard Rock Cafe and shop in Chaweng. First reactions I saw mentioned overpriced food that can be had cheaper and better at other places. Do you agree? The forecast for the next ten days didn't change much, mostly partially clouded skies with a nice wind at times and an occasional tropical shower. It's fairly cloudy over Koh Samui this morning with a nice little bit of wind blowing to keep it cool. Current temp at 7am is 27C and I expect it to remain mostly cloudy today with possibly a tropical shower thrown in for good measure. The forecast for the next ten days has not changed much, mostly cloudy skies with a nice and cool wind blowing with possibly some trpical showers coming our way. The forecast for the next ten days didn't change a lot, mostly cloudier skies with a bit of wind and an occasional tropical shower but also enough sunshine to make it nice days. Rather typical June weather. It's a late update because I participated in the 9th Cancer Care run in Nathon. organized by the Four Seasons Resort. Upon arriving home there was a snake sitting next to our entrance door of the kitchen in the back of the house. A good reminder that we live in the tropics. The forecast has changed slightly, now the prediction is that it may be fairly cloudy over the next ten days with a light increase in wind and a rare tropical shower. Here's a slightly unconventional way to get myself a pair of new running shoes. Two sets of Vibram Five Fingers shoes are walking on their last legs and I need to replace them but don't have the fund to do so. I'm asking for sponsors and donation to get the required 4,000.-THB together. There's a donation button at the bottom of this page, any support is welcome and can be seen as a token of support and apprecation for the time and dedication I put into this blog. Holes under the heels, preparing for becoming a bare foot runner? As a follower and reader of my blog, you may know my love for running by now. It's my hobby and I enjoy it tremendously. However, two pairs of my running shoes are about to disintegrate and short of becoming a complete 100% bare foot runner, which would be my next step and currently only avaialble ption, I hope to be bale to generate enough money from generous donations to be able to get a new pair of Vibram Five Fingers Evo. Any donation is welcome, as small or big as you can afford and in the unlikely event I get more than the needed 4,000.-THB, race fees, travel expenses and loads of other bills will be paid from it.